For the record, I try to debut a vegetable in our CSA box rather than at farmers’ market, whenever possible. So, when you stop at our table and we have only peas, green beans and a few herbs, it’s because we fill CSA shares and our own pantry first. Anything above that goes to market! Today is the season debut of carrots! My favorite way to eat them is simple, steamed then served with butter and dill. This may be the last time peas will be in the box till later in the year, here’s a pound. Again, we have a pound and a half of green beans, for which, there is no end in sight! Still just one small zucchini per share. Also, one cabbage and some red onions. That will be the last cabbage till later in the season, but carrots and onions are still coming. If you are looking for some new ways to use some of your produce, check us out on Pinterest. We’ve got lots for you to look through! Things are starting fill out in the garden! That’s good news for our CSA customers and for the farmer’s market that starts next week. This week’s share features only garden items, a first for this season! Dry edible beans are from last season. 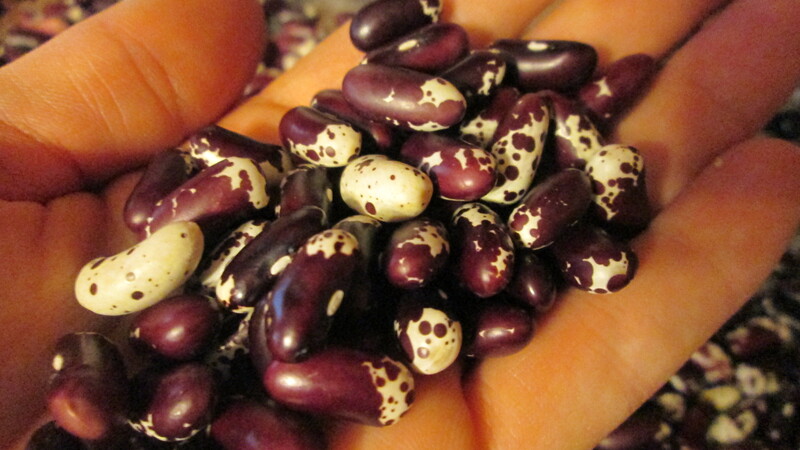 They’re a beautiful variety called Trout bean, Appaloosa or Jacob’s Cattle. Originating from Prince Edward Island, the legend is that it was a gift from Maine’s Passamaquoddy Indians to Joseph Clark, the first white child born in Lubec, Maine. I really like these in a stew. 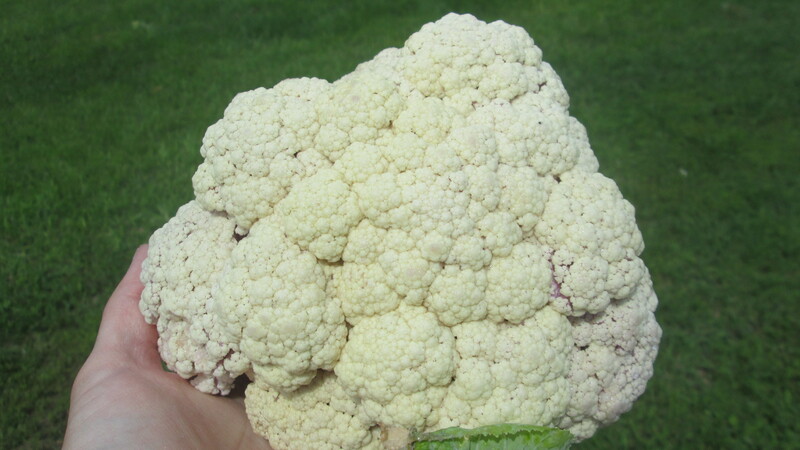 Some of the cauliflower in the hoop house is maturing much slower than others, since snow peas have just started and didn’t yield many in the first picking, there is a choice between the two. The cabbage, so far, is looking beautiful. These are a variety called Farao. 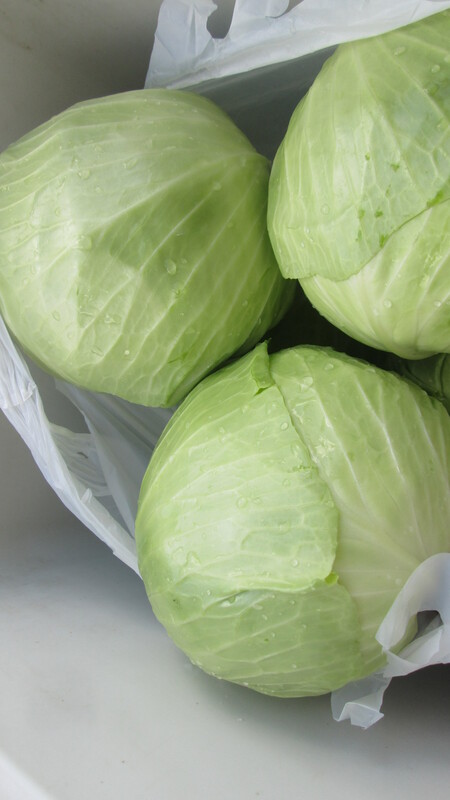 They are not a storage variety, and have tender leaves, so should be used relatively soon. Great for a stir fry or making egg rolls! 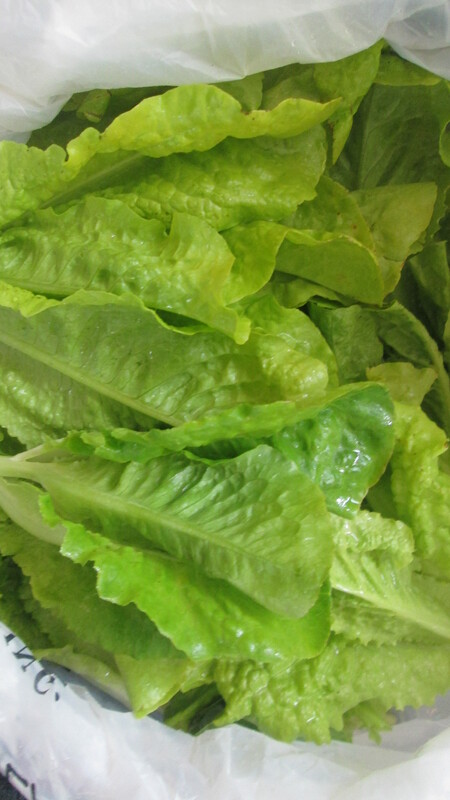 Last, but not least, the lettuce. It won’t be long before it’s too hot for the greens. Make those summer salads while you can! Try this vinaigrette to top yours. If you’re on Pinterest, be sure to check us out: http://www.pinterest.com/squarepegfood/ I’m adding fun recipes all the time, making it easy for you to use all your farm fresh food! The past few days have been really great here in our part of the valley. We almost hit 50 degrees ABOVE zero yesterday, and there are snow-less patches everywhere. This weather has got us pretty excited to get planting. There aren’t too many things that can be seeded indoors this early, but I do have some herbs, cabbage and broccoli going in our seed cabinet. I also have a garden plan for the season, and I thought this would be a great time to share what we plan to grow this season, and what you can expect at the market booth and in CSA boxes in a few months. Expect a wide variety of tomatoes, peppers and winter squash. These are the veggies that get me excited, there are so many beautiful varieties that I find it hard to choose just a few! If there is something you’d like us to add, let us know sooner rather than later. We’ll do our best to incorporate your favorites, as long as you promise to purchase them when the time comes! 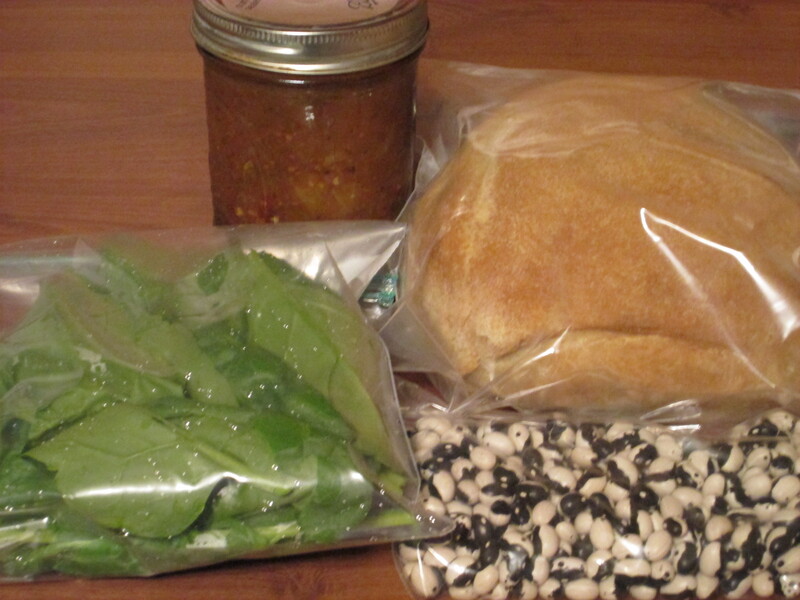 This was the first week of our first season offering CSA shares! If you are not familiar, CSA stands for community supported agriculture. 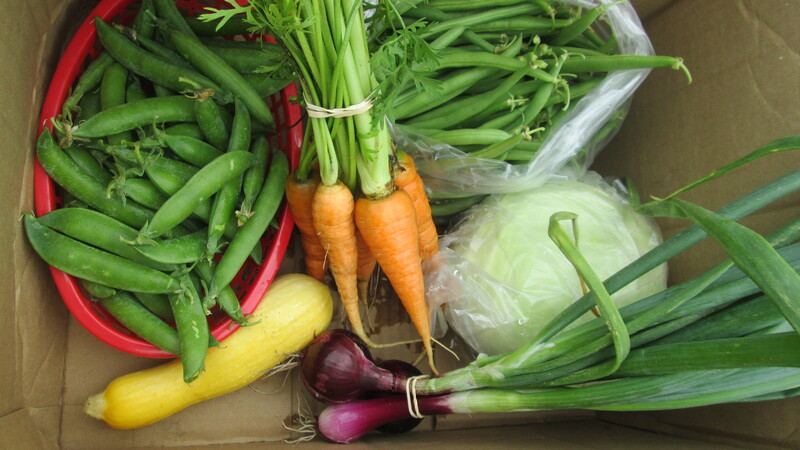 Each CSA is different, some require a certain amount of time to be spent working on the farm. Others, like ours, are basically buying a subscription to what is available during the season. We had anticipated having a good amount of produce available to start shares 2 weeks ago. The wet and late spring weather changed those plans. So this week brought an abbreviated share and we expect that next week will be much the same. We are hopeful though! The tomatoes and peppers have had flowers for quite some time and our peas are just starting to flower. The greens had a slow start, but they seem to be coming along well. Things are growing and we expect that shares will really start to fill out soon. Thanks to our members for bearing with us! The pint of tomato sauce was made with last years produce. We have found it to be equally good on pasta or as a pizza sauce. We used a variety of heirloom tomatoes, they varied in color from green, yellow, orange, purple and red. 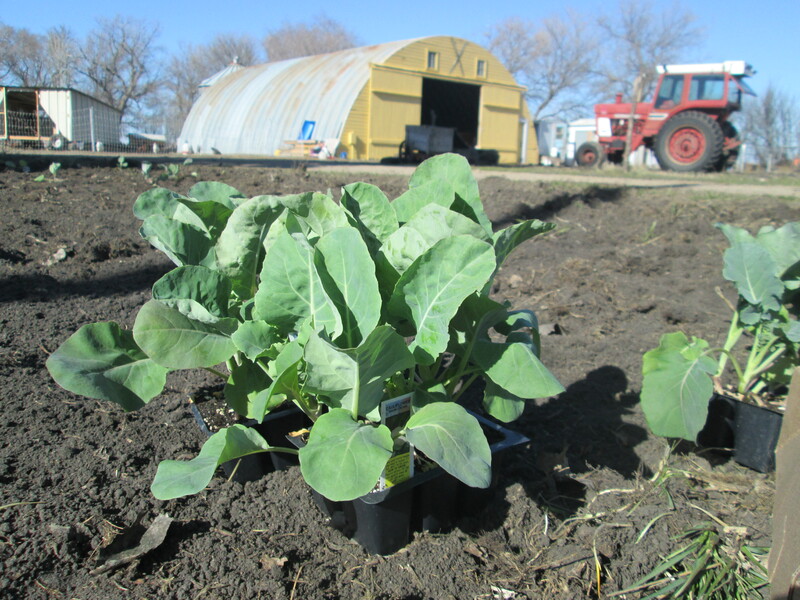 This photo shows spinach but some members received kale and others got broccoli. We mixed it up a bit to be able to add something fresh to each share. If it would cool down just a bit, we’d have some great greens. The bread is sourdough made with wild yeast. About 3 years ago, I started a sourdough starter, just water and flour set on my countertop. It was colonized with wild yeast and the mixture started to bubble. When I make bread I use about half of my starter then add sugar, salt flour and water. Then I add more flour and water to the starter container and it keeps on growing and lives in the refrigerator between baking days. This is the way bread was made long before you could buy yeast at the store. Our rain total from this system is currently at 2.10 inches. 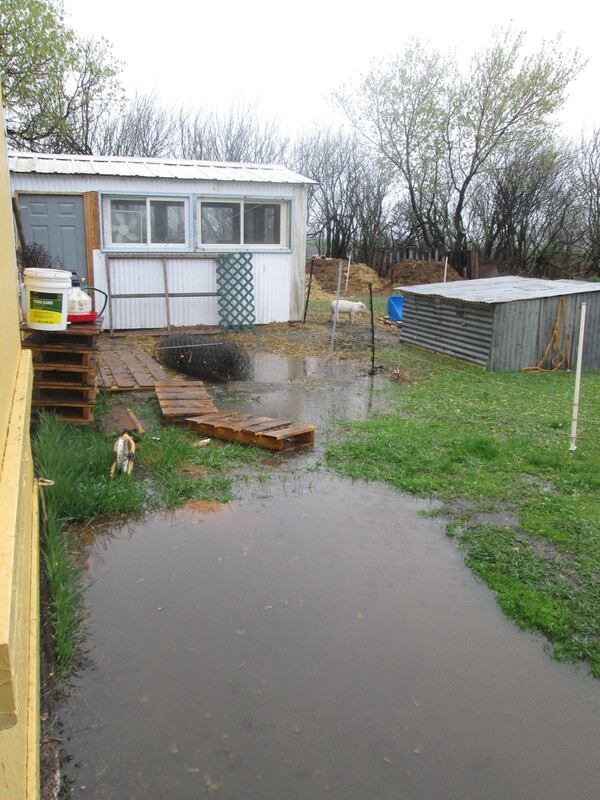 We can’t complain too much since we got about 99% of the garden in ahead of it and we didn’t see the 5+ inches that some parts of North Dakota did. Sadly, gone are the days when a rain day meant staying home from work and hanging out in PJs all day (Heather used to work on a landscaping crew and looked forward to days like this.) 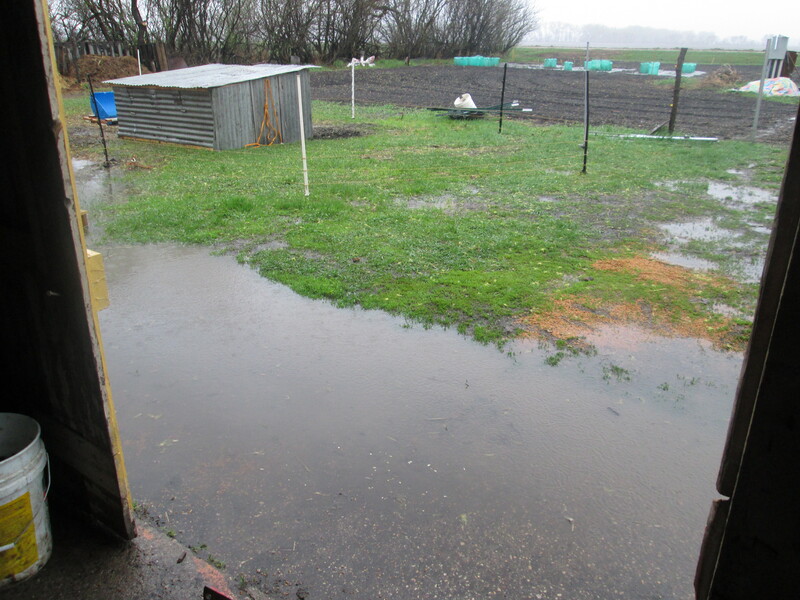 Now a rain day means a bit more work with extra checks on the animals to make sure they, and their feed are staying dry! Time to put the boardwalk back down so we can get to the coop and pig shelter. In addition to the extra work that a rain day brings, it was also a chick delivery day! Heather and Eva made an early trip to the post office to pick up 100 chicks so they could get situated into their indoor home. These puff balls will be indoors for 2-3 weeks depending on the weather. Then they will head outside into a portable shelter, allowing them to enjoy grass, sunshine and tasty bugs. 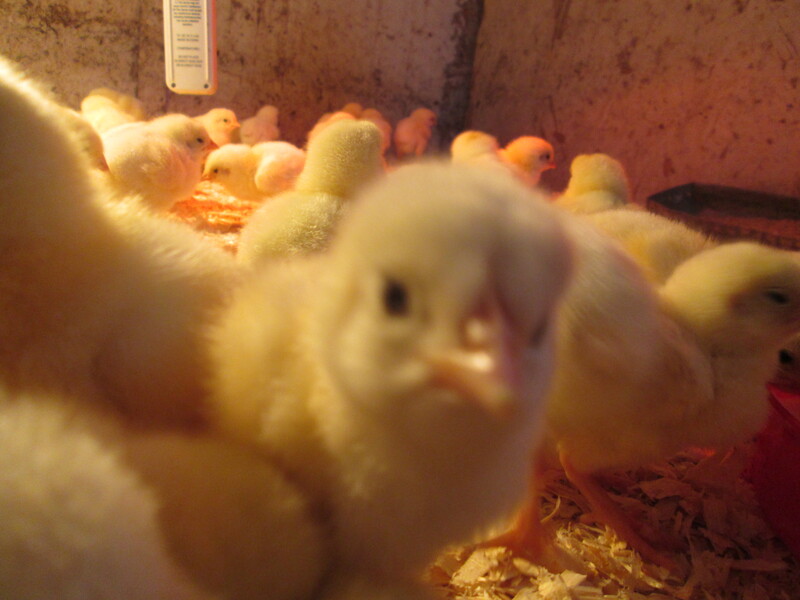 Right now these chicks are adorable, but in about 8 weeks they will be delicious! 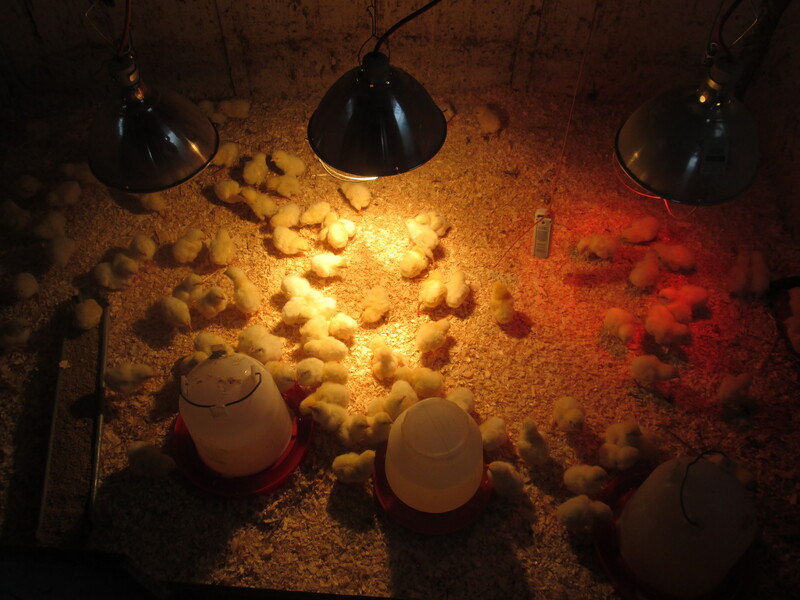 100 new chicks all warm, dry and snug in the brooder. Finally, on the 5th of May, I did our first real planting of the year! On Sunday, I made my first trip to Helen’s Country Greenhouse just outside of Minto to pick up some cole crops that I didn’t raise from seed: broccoli, cauliflower and cabbage. Kale is another in the same family that we have started in our seed cabinet. It sure feels good to have some ground planted! For those of you who don’t know, Dave and I like to push the seasons! We have tomato seedlings that could go into the ground right now, if only our garden space wasn’t still so wet. 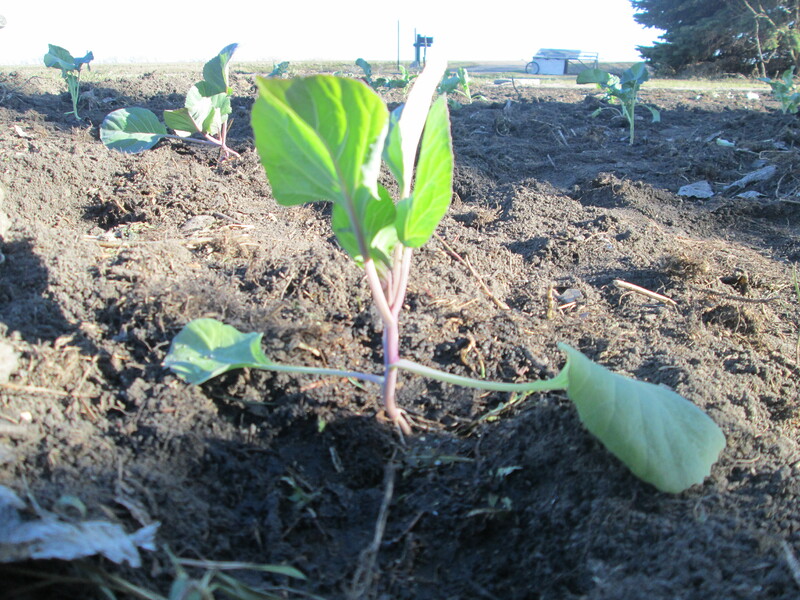 I had marked on the farm calendar to have peas, spinach, radish, cabbage, cauliflower, broccoli and carrots in the ground about 3 weeks ago. Our garden still had snow piles 3 weeks ago. Needless to say we’ve been chomping at the bit this year and these photos make me feel a bit better about the season!